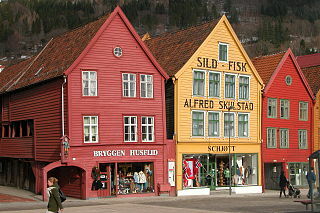 Shopping center located in Bergen is Bryggen Hanseatic Wharf at the heart of the city of Bergen. It seemed to have the magnet so that the tourists will feel at home spending their time there. No wonder restaurants, clothing stores, cafes, and many souvenir shops scattered along the Bryggen. Souvenir prices at the store are quite expensive. In fact, for the size of the Bergen price should be much cheaper than in Oslo. You may be losing appetite to explore the contents of the store. In addition to the stores crowded with visitors, tourists too lazy to waste time window shopping without buying anything. As we passed the fish market at Torget which is located not far from the Bryggen, some merchants open stalls selling a variety of souvenirs. The merchants that sell key chains, statues, and various stuffed animals of various sizes typical Scandinavian. There is also a cheese slicer into souvenirs Norway, purses, table decorations, and a variety of funny mug. Variety of T-shirts with various symbols Norway, gloves, hats, jackets until fluffy. All merchandise in Torget Fish Market no less good and the price is much cheaper than a souvenir shop in Bryggen. You might be shopping rush when I saw the prices listed, 39 NOK for a stuffed elk with Norwegian flag on the side of the abdomen. You can still bid again with a cheaper price. You can bet you will be pleased to be able to get cheap souvenirs, perhaps great as full of souvenirs to accompany you out of Torget Fish Market. However, there are legal expenditures and prices apply when there is quality you shopping for souvenirs at Torget Fish Market. The price offered is much cheaper, but the quality of the goods can not be equated with souvenirs that are sold in stores. Always carefully before buying and make sure there are no defects in the souvenirs to be purchased. If you do not want to be bothered and want to buy a souvenir that have quality number one. Please shop at the Bryggen Hanseatic Wharf.